A certain spiritual aspirant went to a sage and asked him to give him a mantra. The sage said that he would impart the message only if the disciple agreed to serve him for twelve years, carrying out all his injunctions. The disciple agreed and carried out his services to the preceptor with devotion for twelve years. At the end of the period, when the sage felt that his own end was approaching, he asked the disciple to bring a palmyra leaf on which he would inscribe the mantra before his death. The disciple went in search of a palmyra leaf, but before he could return, the preceptor died. 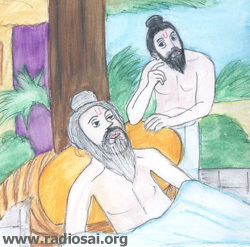 On enquiry from a boy who was there, the disciple learnt that before dying, the sage had written something on a bed of sand, which a woman had copied but then had wiped off the inscription. The disciple went in search of the woman, who had some donkeys. He learnt from her that she had inscribed on the palm leaf roll that she wore in her earlobe what she found on the sand. When she learnt from the young man that the writing on the sand was a mantra intended for him and for which he had served the sage faithfully for twelve years, the woman said that she would give him the palm leaf only if he served her dutifully for twelve years. 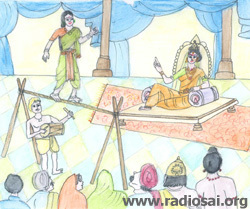 The disciple, who was determined to get the mantra at any cost, agreed to serve her. 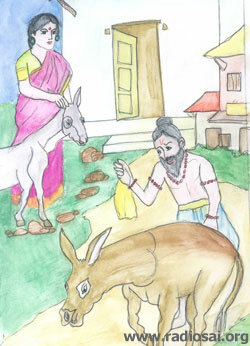 The young man looked after the donkeys and served the woman for many years, living upon the food given by her. One day, he could not get the food from her and went about in search of food. At that time, he learnt that the king of the region had been feeding the poor for a long time and that he might be able to get food if he went to the feeding place. On going there he learnt that from that day, the king had stopped feeding the poor because it had not yielded the result he had expected from it. The king had started feeding the poor on the advice of his preceptor who had told him that he would have a son if a truly godly man ate the food that he would serve to the poor. A bell was kept in the palace and when it rang by itself, that would be the sign that a godly man had partaken of the king’s food. As the feeding had gone on for a long time without the bell ringing, the king decided to stop the feeding. That was the very day when the young disciple went to the feeding place. 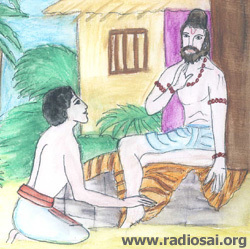 On learning that all the vessels used for cooking the food had been sent to the river for cleaning, the young man hastened to the river bank to find out whether some food scraped from the vessels would be available for him. He found some crumbs at the spot and started eating them. At that very moment the bell in the palace started ringing. The king was startled to hear the bell and immediately sent out messengers to find out who was the person who had eaten the food that day which made the bell ring. After enquiries, the messengers traced the young man at the river and brought him to the king. The king was overjoyed on seeing the young man because he felt that he would soon have a son. 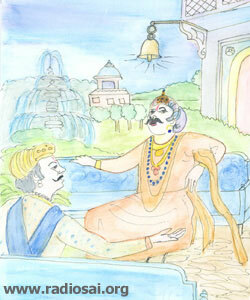 He offered the young man half his kingdom and invited him to stay with him. The young man told the king his whole story and said that he was not interested in the kingdom or anything else, but only in the mantra from his guru, which was now in the keeping of the woman with the donkeys. The young man insisted that the palm leaf earring worn by the woman should be obtained without any compulsion. The king sent out men to trace the woman, who was brought before him. Learning that she was an acrobat, who could perform feats on a rope, the king asked her to demonstrate her skill before the queen who was now enceinte. As she was dancing on the rope, he asked her whether she could catch two diamond earrings he would throw ot her and wear them while dancing on the rope. She readily agreed. The king threw the shining diamond earrings at her. Catching them in her hands, she took out the palm leaf rings from her earlobes, cast them down and wore the diamond earrings in their place. As the palmleaf earrings dropped down, the young man rushed towards them and eagerly read the message inscribed therein. Immediately after reading the mantra the young man secured instant illumination and liberation thereafter. A spiritual aspirant should have such determination and preparedness for any kind of sacrifice to achieve his goal.